Let me be clear about the title. When I say “skinnyness” I do not mean being unhealthy skinny. What I meant was being healthy and fit. So you might ask me why sweet potatoes? And I’ll say why not? Quite recently I joined the “team beach body” wagon of Insanity and P90X workouts, and now I know what it means and takes to be part of the special and elite group of these merciless workout program survivors. I am very proud to be a part of that group! I am currently working on my 60 day Insanity challenge, and I am not too far away from the finish line. Through the last 60 days what really kept me going was not just the fun workouts and Shaun T yelling in my ears saying, “dig deeper” or “you can do it” or better still, “you just gotta F***ing do it”, but it was some of the diet tips from him that made a huge difference as well. And the food that really appealed to me were the “sweet potatoes”. Most of us will easily miss the “sweet potato” aisle in the grocery store. But next time you are there, pick a few up, because it has all that your body needs. It truly is a powerhouse of food as it contains Vitamin B6, Vitamin C, Vitamin D, Magnesium and Iron. To top it all, it tastes wonderful! Most diet foods I have come across have been bland and boring and that is what I struggle with when I am trying to watch what I eat. The trick here is the way you cook it. 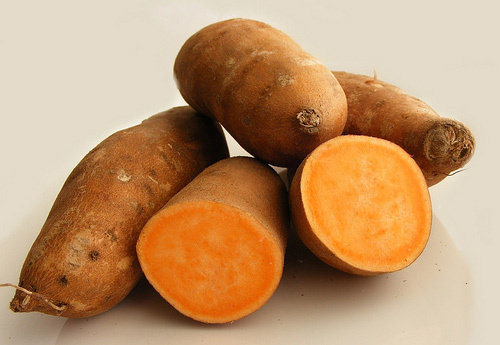 And in case of sweet potatoes which already are tasty, it gets even easier to make the food interesting and fun. I found a great recipe that I have enjoyed trying out. It is quick and simple and it adds an extra zest and flavor to the sweet potatoes, making them very appealing to your taste buds.